2011 turned out to be a fantastic year for film. Had you hopped in a time machine and traveled back six months to tell me I would eventually write those words, I would call the police and have you arrested for public displays of lunacy. January to May produced few, if any films I felt enthusiastic about. There were some decent ones, certainly, but I didn’t even give a film an A level letter grade until June. But when the year finally came to life? Wow. Just, wow. Filmmakers worldwide produced some of the greatest films I’ve ever seen in 2011, many of them exploring dark topics about fractured human psyches and emotional damage. It was ridiculously tough to whittle down my year-end best-of list to ten films this year, and so, for the first time, I’ve compiled a Top Twenty List. Heck, even then I had some trouble, and wound up including a tie (I won’t say where) to fit twenty-one films on the countdown. Right now, you’re reading Part One, in which I’ll count down the first half of the list, from #20 through #11. Later today, I’ll post the second part – which will simply be titled as the Top Ten Films – which will include not just text descriptions of the top choices, but a video version as well, narrated by me over clips and music from the movies. Now, some of these films won’t see an American theatrical release or expansion until 2012, so to remove any confusion, here are my rules for making this list: If it was a new film I saw in 2011, exhibited somewhere in a movie theatre (a multiplex or a festival) then it’s eligible for the list. 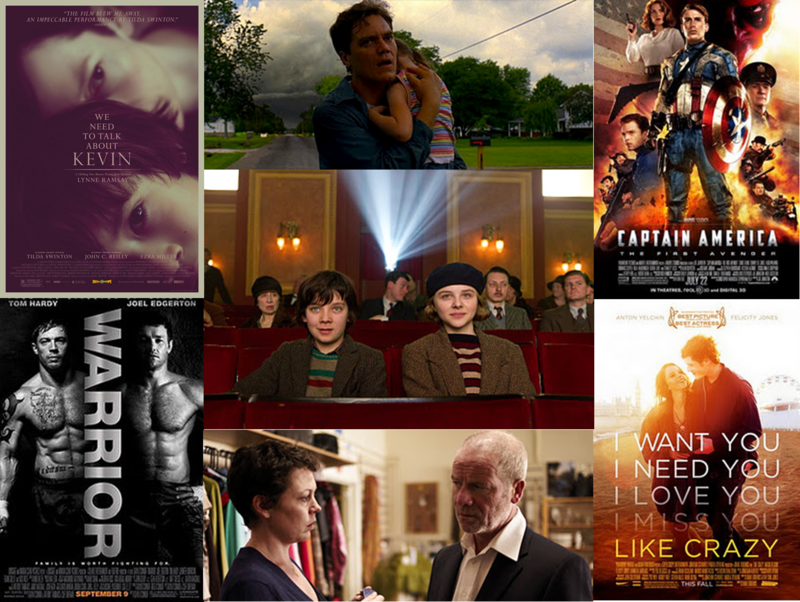 Without further ado, read Part One of my Top Twenty Films of 2011 after the jump…. NOTE: Click on the title of each movie if you would like to read my original review of the film. No film in 2011 was so relentlessly determined to have fun, and I suspect that even if director Joe Johnston hadn’t crafted a superhero flick firing on all cylinders, that passion and desire to please would still result in a good time. But Johnston knows exactly what he’s doing – “Captain America” is the rare action film that works on just about every level. I love the story. I love the characters. I love the visuals, the set pieces, the music. Chris Evans is a perfect Captain America, Hugo Weaving makes a great villain, Tommy Lee Jones relishes every scenery-chewing second, and Haley Atwell makes Peggy Carter one of the strongest female characters in a superhero movie to date. 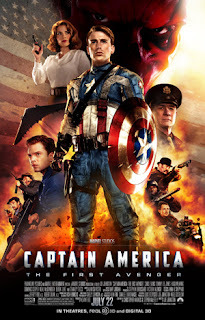 Film critics and scholars tend to forget that one of the primary purposes of filmmaking is to entertain, and few if any films in 2011 achieved that goal as spectacularly as “Captain America.” It may well be the most gloriously fun American adventure film since “Raiders of the Lost Ark,” and to my mind, captured the spirit of early-era Spielberg even better than Spielberg’s own new contribution to the genre, “The Adventures of Tintin.” Captain America is currently available on DVD and Blu-Ray. “Wish Me Away” is one of the most disarmingly candid documentaries I have ever seen. 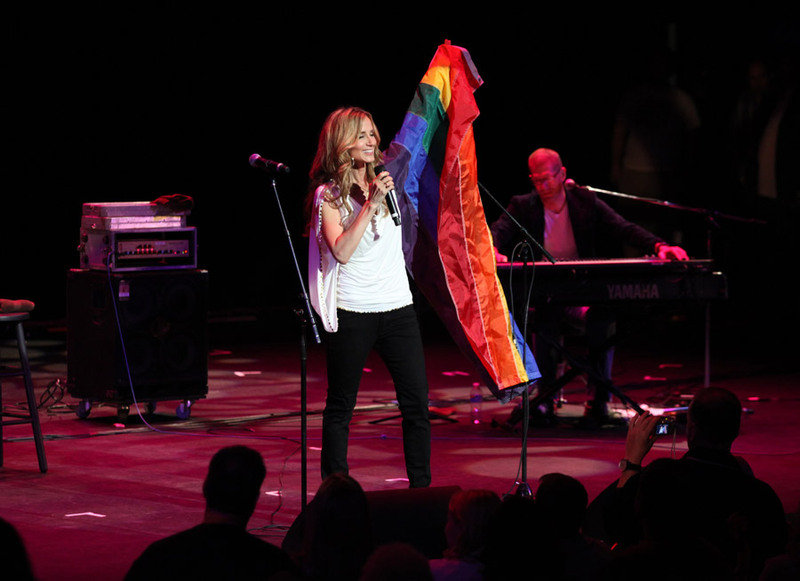 It tells the story of Country Music artist Chely Wright, who in May 2010 became the first major country star to come out as gay. The documentary is remarkable for a myriad of reasons, but it works primarily because of how open and honest Chely is about her experiences; we get to know her on what feels like a very personal level, something many documentaries strive for but few achieve. Her story is amazing, inspirational and heartbreaking in equal measure, and touches on many important modern topics, from the nature of the celebrity to problems in the Country music scene to, of course, how society and culture treat homosexuals. But “Wish Me Away” never succumbs to sorrow, and indeed, the topic that spoke most strongly to me was the dissection of religion; despite overwhelming odds, Chely has remained a devout Christian – if anything, her experiences strengthened her faith. I don’t know when or if “Wish Me Away” will get a wide or limited theatrical release, but if you ever have the chance to see it, you truly owe it to yourself to see this movie. Wish Me Away is currently touring film festivals across America. 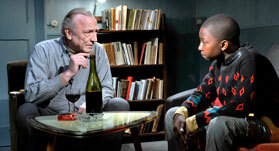 Aki Kaurismaki’s “Le Havre” is a warm, comforting hug personified through film, a joyous movie that has not the room nor tolerance for evil or darkness: good things happen to those who do good, people are warm and compassionate towards one another, and hard work pays off in spades. It tells the story of Marcel Marx – one of my favorite characters of 2011, played beautifully by Andre Wilms – a man who, after his wife is hospitalized, devotes his time to helping a young African immigrant find a way to London, where his mother is waiting. All of the characters in Marcel’s community are splendid, and the film boasts a warm message that is subtle yet meaningful. Most importantly, Marcel’s journey is oodles of fun at every turn. “Le Havre” is a testament to the power of pure, unabashedly jubilant entertainment, and I can’t imagine a single person not being charmed by the experience. Le Havre has not yet been announced for release on DVD, but it may be found playing in limited release in some American theatres. My favorite documentary of 2011, “Being Elmo” is an exceptionally well-made film, but like “Wish Me Away,” it works so well because the subject is so engaging and fascinating. 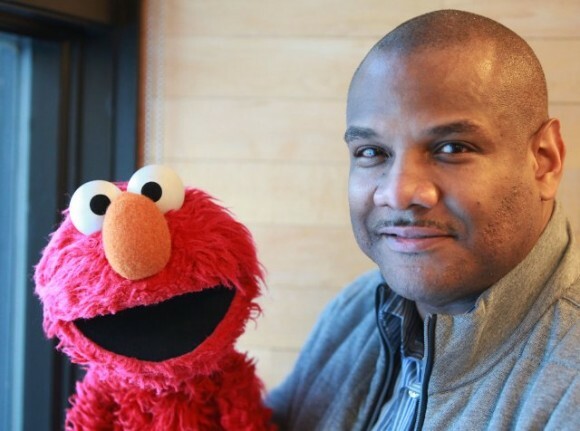 Kevin Clash has lived an amazing life, and as we watch him rise through the Jim Henson ranks, fulfilling all his dreams one by one, we are inspired to go out and make our own dreams come true. Like the new “Muppets” movie, the film also exemplifies the humanity and grace that goes into creating such wonderful characters like Elmo, epitomizing why we will always need these sorts of pure, idealistic figures in pop culture. A beautiful scene where Clash introduces Elmo to a young, dying cancer patient, giving her the unconditional love she needs and Elmo can deliver, just about sums it up. Being Elmo will be released on DVD on April 3rd, 2012. 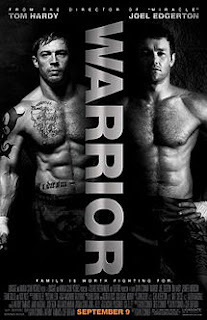 On the surface, “Warrior” may look like a dozen other boxing/fighting films, but dig deeper, and you’ll find one of the deepest, most hard-hitting films of 2011. It features heart-wrenching, honest performances from Joel Edgerton, Tom Hardy, and especially Nick Nolte, uncompromisingly brutal fight choreography, and a story more interested in critiquing and dissecting the art of the fight than embracing it as a means to inspire the audience. It plays by genre conventions while knocking them down flat, and for every punch it dishes out to the characters, it sends another equally brutal one straight through the viewers’ heart, on and off the ring. It also contains the most emotionally charged pat on the back I’ve ever seen, one that gets me teary-eyed just thinking about it. Simply put, “Warrior” is one of the most unique, raw, and emotionally devastating sports dramas I’ve ever seen, and of the best films to hit theatres this year. Warrior is now available on DVD and Blu-Ray. “We Need to Talk About Kevin” explores the epicenter of a Columbine-esque tragedy: the parent. As a Coloradan, trust me when I say that no conversation about Eric Harris and Dylan Klebold ever goes by without mention of their parents, questioning how anyone could be so unaware of their child’s nature. This is the enigma “Kevin” tackles, and it does so spectacularly, planting the viewer firmly into the mind of a killer’s mother and keeping us there for two straight hours. It is a relentlessly dark and uncomfortable experience, but also a profoundly rewarding one. The mother is never absolved, but we gain a keen understanding and sympathy. How could we not? The key question the film asks is one that should strike fear into the hearts of all viewers: what would you do if you didn’t love you child, if you hated them on instinct and they hated you right back? 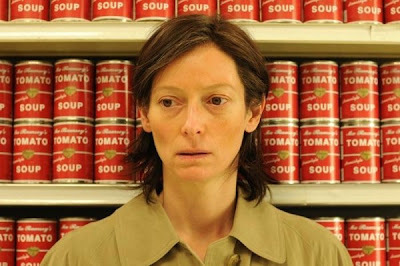 I can think of few topics more horrifying, and the film is proportionally unsettling, thanks in no small part to the amazing Tilda Swinton giving the performance of her career and Lynn Ramsey’s brilliant, suspenseful direction. 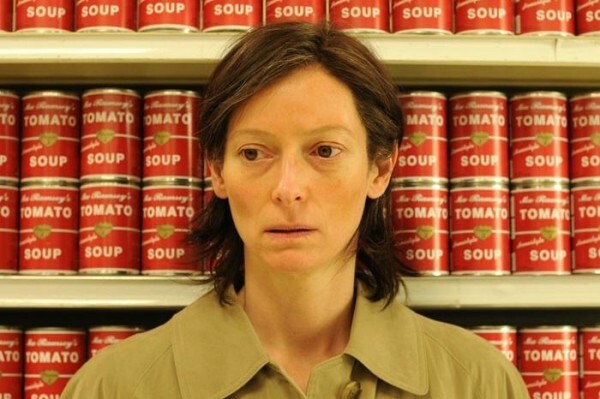 “Kevin” is a true masterpiece, but it is such a harrowing experience that I can say, in full confidence, I never want to see it again. We Need To Talk About Kevin is now playing in limited release in select theatres, and will expand beginning in January. Here’s a film I greatly enjoyed while watching that has only grown and grown in power as I’ve pondered it over the last two months. The directorial debut from British actor Paddy Considine, “Tyrannosaur” is a beautifully bleak portrait of two heavily damaged people, Joseph and Hannah, brought to life stunningly by Peter Mullan and Olivia Colman in one of the best acting duets I have ever seen. Joseph is a heavy drinker with anger issues and a lonely life, while Hannah is abused by her wicked husband, but for some strange reason, the two find solace in one another, each bringing out the best in the other person. As people, they are neither bad nor good, but merely human, and the slice of happiness they carve out for themselves in each others’ company may be the best the divine power Hannah believes in can do for them under their present circumstances. As brutal and unflinchingly dark as “Tyrannosaur” often is, I can’t help but smile when I think of that core theme. There’s something undeniably life-affirming about something so simply, fundamentally good rising out of such impenetrable darkness. Tyrannosaur is playing in limited release in select theatres across America. It will be released on DVD and Blu-Ray in the UK in February, and in other territories later next year. 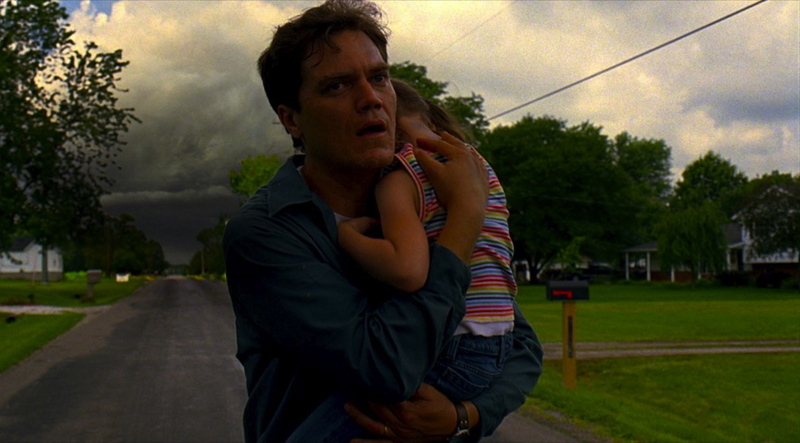 I have never seen a more powerful cinematic expression of schizophrenia than in Jeff Nichols’ “Take Shelter,” a film about a man, Curtis LaForche, who channels his growing insanity and paranoia into a storm shelter he builds to protect his family. The shelter jeopardizes his family and finances, but as a vindication of his dark dreams and thoughts, he needs it in a way even he can’t quite comprehend; the film is so well made, Curtis played with such blinding humanity and rawness by Michael Shannon, that we sympathize with and understand his fragile mental state. At a certain point, the viewer wants to run and hide in that shelter just as much as Curtis does. This is powerful psychological filmmaking at its finest. Take Shelter will arrive on DVD and Blu-Ray on February 14th, 2012. “Like Crazy” is the rare love story that is actually about romance, taking an honest, hard-hitting look at the space lovers inhabit and, more importantly, the space between them. It chronicles two young people as deportation and bureaucracy tests the limits of their love, and is executed with a raw, fly-on-the-wall style. We are not watching a film, but observing two very real people in real situations, and that immediacy makes the happy times that much more intoxicating and the sad stretches all the more harrowing. Anton Yelchin comes into his own as one of the brightest young talents in acting, but it’s Felicity Jones who really steals the show as the more complex and relatable member of the couple. Both play their roles with incredible amounts of nuance and realism, and writer/director Drake Doremus never pulls a punch or insults the audience’s intelligence with Hollywood-style declarations of love or a disingenuous, happy ending. “Like Crazy” is an experience I’m unlikely to ever forget, and a clear highlight of 2011. 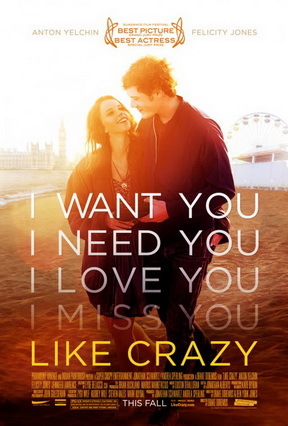 Like Crazy has not yet been announced for release on DVD or Blu-Ray, but may still be found playing in select theatres. “Hugo” is perhaps the ultimate statement Martin Scorsese will leave behind as a filmmaker, an explanation of why he devoted his life to the art form he loves so much. When future generations study the history of cinema, “Hugo” must be required viewing, a lesson in the worth and power of the cinematic medium straight from the mouth of one its greatest masters. An impossibly rich film, it works on more levels than I can possibly count, and is filled to burst with fantastic characters, beautiful performances, gorgeous production design, thoughtful themes and messages, and the first use of 3D that actually enhances the power of the cinematic medium. One could watch this film a dozen times and see a dozen different movies. All of them are masterpieces. “Hugo” was very, very tough to omit from the top ten, the kind of film I can see becoming a personal favorite in years to come, and I can’t recommend it highly enough. 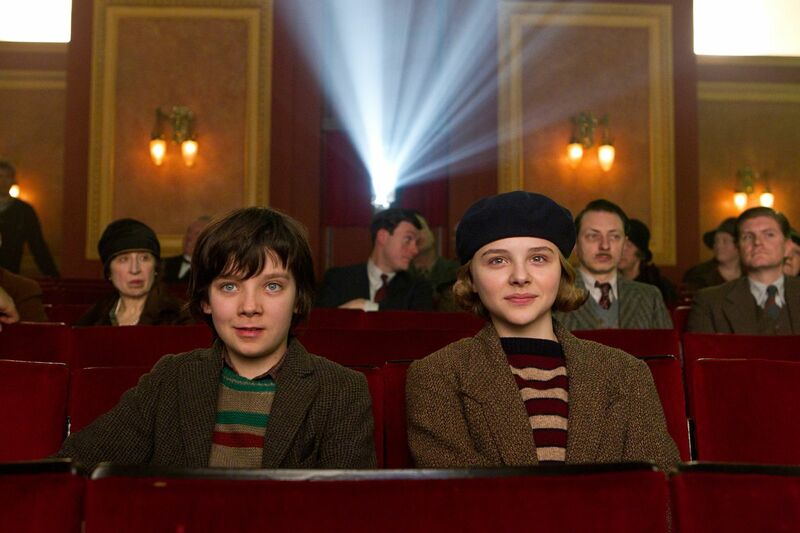 Hugo is now playing in theatres everywhere. TO BE CONTINUED – Come back later today to see my picks for the Best Ten Films of 2011, in video form!